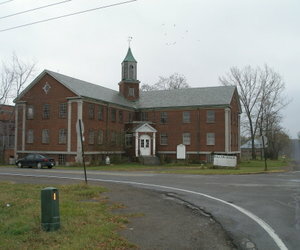 The Rolling Hills Asylum is considered to be one of the most popular real haunted places in America. This particular structure was originally opened in the year of 1827. In its earliest days, this haunted building was used as a refuge for individuals that were not well off financially. Many have referred to it during this time as a “Poor Farm” based on this fact. It was not at all uncommon to find many troubled individuals staying at the structure in the 1800s. Examples of those you may have seen residing at the facility include, but are not limited to: the mentally ill, children that were considered to be orphans, those that suffered from alcoholism, and even those that committed violent crimes against others – such as murderers. In this haunted places to go guide, you will be introduced to the Rolling Hills Asylum. The Rolling Hills Asylum originally opened by the government in order to offer various types of support and even housing for individuals that were considered to be needy in one way or another. Poorhouses were considered to be common in both the 19th century as well as the 20th century in the United States. Individuals that were considered to have the capability were required to conduct work on the grounds which the structure was located. These types of structures were all over the United States. In the 1930s, the program for Social Security started and these structures were not as common as they once were. As time progressed, additional structures were incorporated onto the building. The additional structures assisted in keeping those with severe mental illnesses away from others, as well as those that did not follow the appropriate rules for conduct. The individuals that governed the structure eventually created rules that ordered those suffering from severe cases of insanity to be relocated and ordered to another specialized institution in the state of New York. Individuals that were permitted to reside at the facility were referred to as “inmates”. It did not matter why the resident was ordered to stay there. If the inmate was physically and mentally able, they had the responsibility of tending to the cultivation of crops, care of animals, and other chores on the farm. •	In the room that is identified by locals as the “Christmas Room”, it is common to find that the toys are being moved from one location to another with absolutely no explanation. •	Many individuals often hear footsteps coming from above the 2nd floor ceiling despite the fact that there is no floor above that room. •	Disembodied voices have been heard in the kitchen area as well as the meat locker region of the area. •	A male apparition and shadows that appear to be male have been observed by many visitors and employees alike.